It took only a sophomore student of St. Jude Catholic School to sweep the Sudoku contest away when Ma. Czarina Angela Lao, 15, emerged as the new champion of the grandmaster category of the 6th Philippine Sudoku Super Challenge National Finals held at SM North EDSA in Quezon City last January 28, 2012. Having solved correctly most of the 21 Sudoku puzzles in the first five rounds, Lao moved to the 6th round for the championship stage where the 1896.2 total points she garnered made her stand with much ease to be this year’s little giant in the Philippine Sudoku. As champion, Lao won P60,000 and a trophy. 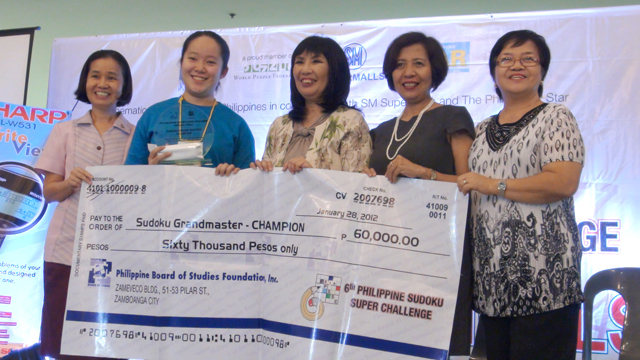 Besting 37 other Sudoku grandmaster participants were Alvin Ian Chan of Ateneo de Manila University, first runner-up, winning P40,000 and a trophy; Kaye Janelle Yao of Grace Christian College, second runner-up winning P20,000 and a trophy. Jemima Sawey of St. Louis University Baguio, third runner-up and Ralph Sarrosa of University of the Philippines Visayas in Iloilo, fourth runner-up took home gift certificates courtesy of SM Supermalls. Emerging champion in the Sudoku Wizard category with 156 national finalists is another 15-year-old Dielle Tio of St. Stephen’s High School winning P50,000 and a trophy. The other winners are Melvin Baldrias of Da Canlao Agoncillo National High School in Batangas, first runner-up, winning P30,000 and a trophy; Ethan Riley Chan of Zamboanga Chong Hua High School, second runner-up, winning P20,000 and a trophy. Chesko Grezula of Olongapo National High School, third runner-up and Cheyenne Hsieh of Grace Christian College, fourth runner-up also brought home gift certificates. In the Sudoku Whiz Kid division, which had 56 finalists, 11-year-old Natalia Beatrice Dy of St. John’s Institute of Bacolod City won as champion and brought home P20,000 and a trophy. Making it to the top five are Candice Renee Beatrice Solidarios of Integrated Montessory Center in Laguna, first runner-up and won P10,000 plus trophy; Gerald Dalan of Olongapo Wesley School, second runner-up and won P5,000 plus trophy. Clyde Wesley Ang of Chiang Kai Shek College, third runner-up; and Guineveve Soria of Precious International School of Davao, fourth runner-up received gift certificates from SM Supermalls. The opening program in the morning was interrupted with applause and laughter from finalists and spectators as the guest speaker Dr. Cecilio K. Pedro, President and Chairman of Lamoiyan Corporation gave inspiring messages, challenging the participants to be world class Pinoys. Inspiring the participants with their messages were Dr. Emelyn Libunao, Staff Director for Program Management, Philippine Information Agency and Ms. Millie F. Dizon, Vice President for Marketing Communications, SM Supermalls who also presented the awards to the winners. Playing significant roles during the contest were the chief jurors, Prof. Ma. Luisa Villano, Admissions Officer, Miriam College and Dr. Jaime Caro, Assistant Vice President for Development and Director, UPIT Training Center Program. Their members were former MTG kids who are now successful in the different fields of endeavor. Other sponsors of the 6th Philippine Sudoku Super Challenge National Finals are Phoenix Publishing House, SHARP Calculators, Zamboanga Today, JFC Publishing, Vital, Adtime and Space, Hapee Toothpaste, McDonald’s and some MTG kids. Dr. Simon Chua, president, MTG Philippines said that he was surprised with the turnout of the regional elimination round which gathered more than 6000 participants from all over the Philippines. He said that the MTG would decide who among the winners would represent the Philippines in the 2012 Beijing International Sudoku Tournament in China in May, the 2012 World Sudoku Championship in Croatia, BRAND’s Sudoku Challenge 2012 Asia Pacific Open in Singapore and 6th BRAND’s Sudoku Thailand International Open 2012-Princess Somsawali Cup. This entry was posted in News article on January 31, 2012 by admin. The MTG Philippines has promised that this year’s Sudoku national finalists will solve more challenging puzzles which come in ascending difficulty. To know more about the types of sample puzzles which are likely to come out in the contest, they can see the puzzles featured in Philippine Star and Zamboanga Today. On the accommodation aspect, only those national finalists from provinces who have been notified can avail of the free hostel accommodation courtesy of Phoenix Publishing House, Inc. Non-participants are not included in this package. However, coaches and accompanying persons who wish to stay with their participants may contact Mr. Robert J. Degolacion, MTG Office Director at his email address, rjd182001@yahoo.com, for reservation. Please be guided that the 6th PSSC T-shirt which will be issued upon registration on January 28, 2012 and will be used in the entire duration of the contest. Those contestants who failed in indicating their shirt sizes will have to settle for the available shirt with the closest fit. The registration will start at 8:30 AM so please be at the contest venue an hour or so before. School or company ID must also be presented during the registration for your advantage and convenience. Please take note that the registration will close at 9:30 AM. Moreover, since SM North EDSA opens for business at 10 AM, and the registration starts at 8:30 AM, you may use the Garden Entrance to reach the Citystyle 4F. The RDU Entrance leading to the car park may also be used. There will be signages to guide you to reach the contest venue. Always find time to visit the MTG website for further announcement and information especially on the exact location of the contest at the SM City North EDSA. Likewise, always check your personal email box. Below is the complete and final list of the 6th Philippine Sudoku Super Challenge national finalists. 5 Bangog, Grail A. St. Louis School Center, Elem. Dept. 10 Boyowan, Shania Jade C. St. Louis School Center, Elem. Dept. 40 Reyes, Francesca Amor Saint Paul University Phil. 23 Bermundo, Roxanne L.C. Young Learners' Home Co., Inc.
37 Chen, Kathleen Denise Sun Yat Sen High School of Iloilo, Inc.
49 De Guzman, Kimson John BHC Educational Institution, Inc.
20 Loo, Vincent James Unlmtd. Network of Opportunities Int'l Corp. This entry was posted in News article on January 21, 2012 by admin.